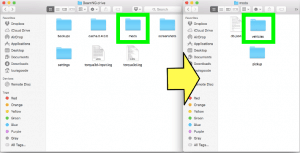 Hello and welcome to this tutorial on how to play BeamNG Drive on your Mac! 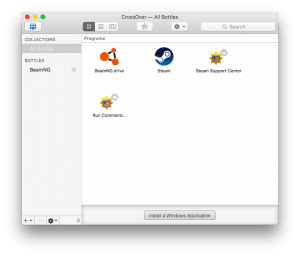 BeamNG Drive is a game/simulator that does not run natively on OSX, only Windows due to the engine that the application is built on. It is possible however to get BeamNG Drive (sort of) working in OSX using a compatibility utility called Crossover. To download Crossover visit the developers website and choose the free trial. Crossover costs $60USD, however you can use it for free for a couple of weeks. 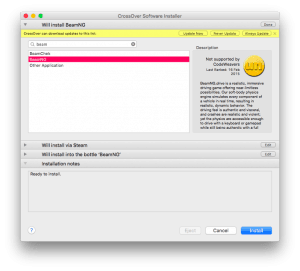 Once you have Crossover installed on your Mac it is fairly simple to install BeamNG Drive, simply follow the instructions below. When you first open up Crossover you should see the screen below. Steam and BeamNG Drive won’t be there yet in your Crossover windows, but they are in mine because I’ve already installed them! So to get started click the “Install a Windows Application” button at the bottom of the window. In the search box that comes up find the “BeamNG” application and press install. Crossover will say that it’s not supported, and while it’s true that the game is not supported officially by Crossover it is supported by the community, and as of now it does work! After doing this Crossover will automatically install a bunch of applications such as Steam and Adobe Flash Player, among others. You will need to click through the prompts and enter personal details when possible, and when you’re done Steam will open up. 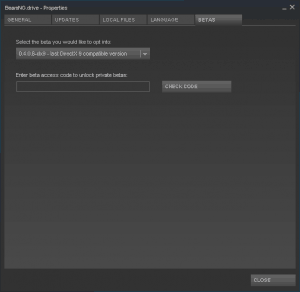 Once you have Steam open you will need to purchase/download BeamNG Drive like you normally would. The default BeamNG build however does not work with this Crossover/OSX setup, so you will need to right click on the game in your library (as per below) as select properties. Now select the Betas tab and from the drop down menu select the last DirectX 9 compatible version of the game. However DO NOT enter anything into the beta access code text box and DO NOT press the Check Code button. After you have selected the DirectX 9 compatible version of the game from the drop down menu simply hit the Close button down the bottom of the window. And thats pretty much all you need to do! 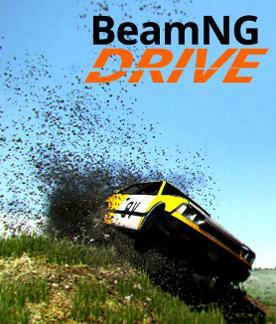 If you launch BeamNG Drive from Steam now the game should start up and you’ll be able to play. There may be some glitches and other issues such as low brightness that are not there in the Windows version of the game, however when I tested BeamNG Drive on my MacBook Air I found the game to be remarkably stable and bug-free. Unfortunately however you won’t get many updates, if any at all, when you are playing BeamNG Drive on your Mac. 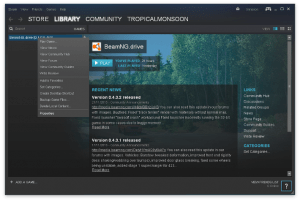 The best option for the best and most updated game experience is to create a Windows partition on your Mac and install Windows + BeamNG Drive on there. When you want to play you’ll have to reboot your computer into the Windows partition, but the game experience will be better. If Inside the BeamNG folder there will be a “mods” folder. 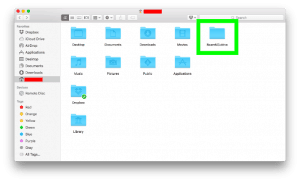 Open that and create a folder within it called “vehicles” (if there is not one already in there). The vehicles folder is where you can put any custom vehicles that you download from the Internet (remember to unzip them first or they won’t work!) Now just restart the game and the custom vehicles should be there! If you have any problems installing BeamNG Drive on your Mac or if there is anything else you’d like to know feel free to leave a comment below and I will reply!